Storm the Palace and kill Lord Richton. Ask Saban to help restore Prince A'tor's soul; the following scene will end with you in the Palace. Enter the Palace through the armory and make your way to the kitchen at D.
Turn the wheel on the wall to remove the kettle from the chimney, optionally putting out the fire using a bucket with water. Climb up to the ballroom at E.
Use the three chandeliers in the middle of the room to reach F, or simply jump to the pulpit. Pick up the silver key. Use the elevator at G. Open the door at the top with your key and pull the lever in the observation tower. Return outside and take the lift up to the Dwarven airship. Face and defeat Dram then Richton. 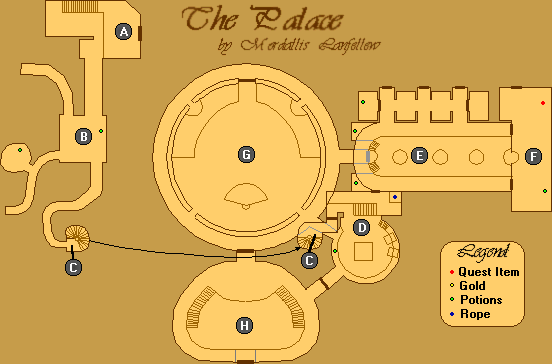 You should make a save before starting this quest, as there is no way to leave the Palace afterward and you do not get to explore the island once you complete the game. Once you have saved Hayle's soul and recovered the soul gem, you can ask Saban the topic "Help with Soul Gem". Additionally, you must retrieve Voa's ring and give Kithral's journal to Nidal to learn that the body of Prince A'tor is hidden in the Temple of Arkay. With these requirements met, the scene Sword of Crown begins. In summary, Cyrus leads Saban to the temple and she begins the ritual to restore the Prince. Basil and his men arrive with Coyle, whom Cyrus ordered to signal the League in the preceding dialogue. 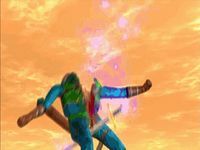 Saban uses the soul gem and Voa's ring, but the ritual backfires and A'tor's soul enchants his sword, forming the soul sword. Basil is disappointed, but Cyrus rallies everyone present with a speech, saying that A'tor chose this form as a symbol of his intentions. He tells the Leaguesmen to attack the harbor while he infiltrates the Palace to go kill Lord Richton. 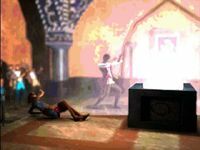 The scene ends with Cyrus entering the Palace through a secret entrance, the soul sword in hand. As you enter this area, the Palace scene plays. Dram and a guard hear the battle in the harbor. Richton cancels the plans to attack the League hideout and prepares to leave Stros M'Kai on his airship. 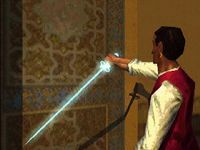 Now in a courtyard of the Palace, you assume control of Cyrus, with the soul sword replacing your old sabre. It does twice the damage, such that all guards in this area die in two hits. Although it may be tempting, do not use strength potions anymore. Due to a bug, your damage will actually be reduced to half rather than increased further. Six high-level guards roam the courtyard. A gate blocks access to a lift up to the airship, and the doors leading into the Palace and the building in the northeast corner are locked. The only open door goes into the wooden armory in the southwest. Five guards stand ready to protect the armory from intruders. You'll notice a number of wanted posters for Cyrus and diagrams of the dirigible. Nothing notable is up the stairs: five locked chests, each at the foot of a bed. Four more beds and chests can be found downstairs. The way forward is through the south hallway. Two guards patrol around this area, one traveling between here and A and another between here and C. These halls once connected to the Catacombs beneath the Palace, but have been sealed off. You can ignore the tunnel going northwest, but the southwest one contains a health potion in an alcove about halfway through. Continue south when you are done exploring. Dispatch the guard at the bottom and climb to the top of the spiral staircase. The door at the top is unlocked. 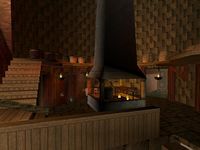 This kitchen area has a chimney in the lower section and a roasting pig up the stairs. You can turn the wheel to rotate the pig and Cyrus exclaims, "Magnificent!" Head up more steps to the storage section to find a health potion. All doors to E are locked, so you'll have to climb the chimney to reach the ballroom. Pick up the bucket near the pig and fill it with water from one of the taps. Back at the chimney, turn the wheel to the left to move the kettle out of the way. Put out the fire using the bucket and climb the chain. At the top, jump into the ballroom's second level. 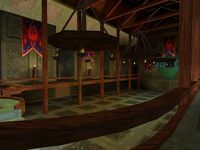 This large room is the one you see several times in cutscenes with Lord Richton and Dram. They are nowhere to be seen now, but in their place are four guards. 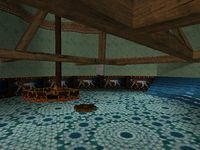 Two health potions can be found down the stairs, under the north and south balconies. All the doors are locked, but there is an opening behind the pulpit in the east leading to Richton's chambers. You can either jump from chandelier to chandelier, or simply jump to the pulpit directly from either side balcony. To get onto the first chandelier, stand on the railing in the west and make a running jump. However, the direct jump to the pulpit is usually easier to pull off successfully. This room has two guards and a health potion in the south. Pick up the silver key on a table in the northeast. With the silver key you can now open just about all the locked doors, including the two that lead back to the ballroom. 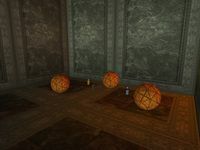 Open the locked door to the northwest in E to find one of each kind of potion among three deactivated Dwarven robots (ignore the strength potion). Enter the throne room through the lower door to the west. This is a large, round room with six guards patrolling inside and out in the surrounding hallway. Climb onto the Dwarven elevator and pull the lever to raise or lower it. At the top, use the silver key to open the door. You exit into a small observation room towering above the Palace. Pull the lever here to lower the lift in the courtyard, allowing you to get to the airship. You can now return to the courtyard the way you came. The doors in the ballroom can be used as a shortcut. 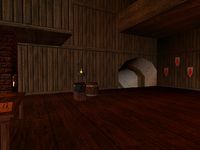 This is the room where you first met and confronted Lord Richton when you delivered the amulet. The exit to the Palace is locked. Back outside, use the key once again to unlock the gate to the lift and ride it up to the airship platform. Dram is waiting for you at the top. Like last time his attacks do 20 damage, so drink a potion of ironskin beforehand. He retreats after 3 hits. Your final opponent, Lord Richton himself, stands ready on the airship. Jump over to it and a short cutscene shows the platform collapse behind you. Richton unsheathes his sword, saying, "I guess, then, it's time!" He is a good swordsman but doesn't move a lot; most of his attacks deal 10 damage, but his spin attack does 20. With 250 health, he will admit defeat after 9 hits from the soul sword. The Ending scene begins. 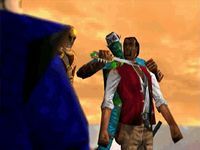 Richton surrenders, but as he turns around Dram sneaks up and holds a dagger to Cyrus' neck. Cyrus reveals the true nature of his sword, that it is imbued with A'tor's spirit. Just before Cyrus is executed, the sword rises and cuts down both Richton and Dram. 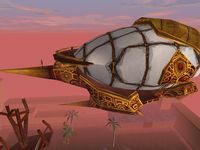 Cyrus manages to fall from the airship as it crashes to the ground. 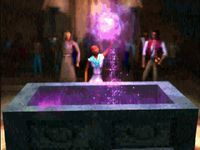 An epilogue taking place some time later shows Cyrus and Iszara back in the Palace, with her assuming leadership of Stros M'Kai. Emperor Tiber Septim has decided to sign a peace treaty with the Redguards following their successful rebellion. Cyrus prepares to leave, ready for another adventure. 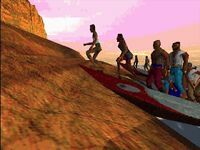 Congratulations, you have completed Redguard! The credits roll and you are taken back to the main menu. 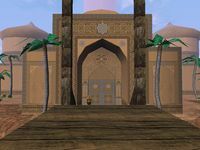 Even though Iszara tells you A'tor's body is being kept in the temple, you have to hear it from Nidal for the dialogue with Saban to continue. You don't have to put out the fire in the chimney to climb the chain, but you will take 10 damage per second while standing in it. Be very careful on the elevator. The collision often fails and you will fall a long way down to the ground. Fortunately, if you survive it will come back down. ? If you are having trouble with this, try climbing on the inner edge as soon as you start the elevator moving. 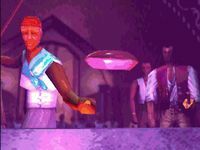 This scene is divided into three parts, which you can skip by pressing ESC (default). 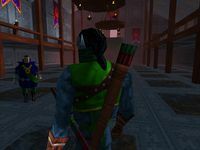 The scene begins outside the Temple of Arkay at night. Cyrus and Saban enter quietly, while an Imperial guard patrols nearby. 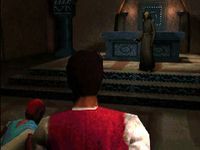 Brother Nidal silently welcomes them, and he and Cyrus proceed to open the tomb containing Prince A'tor's body, revealing the stasis field. Saban walks up to the body and begins chanting in Yoku. Meanwhile, the scene cuts to the Restless League, with Coyle among them, sneaking into Stros M'Kai. Basil kills a guard from behind using a dagger, and the Leaguesmen walk into the temple. Saban shatters the soul gem then falls to the ground. Basil: "What is it? Did it work?" Saban: "A'tor no mangai, Sura." Basil: "What's wrong? What happened? "What did you do wrong?" Suddenly, a blinding flash shines from the tomb. Cyrus: "...his soul is in the sword." Cyrus: "How did this happen...?" Coyle: "She doesn't know. It was"
Basil: "Who cares how it happened? It's over, Cyrus. We can't follow a sword. "You've failed us. We are through." Basil and his men start to leave, but Cyrus picks up the sword. Cyrus: "Is this how you will honor your Prince then? "Cautious I've thought you, Basil, but never before a coward." Cyrus: "We all have waited for the Prince's return. "Now that he has returned, you walk away. "The form is different, true, but his spirit is here, here. "And isn't his spirit the truest part of him? "Did it occur that maybe he chose this shape and symbol as the sign of his intentions? "You say you cannot follow a sword well, I say that you have strayed from your own too long! "Why are you here but to FIGHT! "Your Prince has shown you the manner of his purest mettle, AYE! in metal itself! "but for brave hands, bright swords, and blood. "Aye, boys, it's about blood now! too long frozen in your veins! "then shamefully know that your Prince will! "For his blood be solid, too, but straightened to steel and tempered in death! "Rise alike as he! as swords! as we are Crowns alike as he! All of the Leaguesmen cheer. Basil: "What shall we do?" Cyrus: "You shall secure the harbor, we can't have any more of them coming in. "Once that's done, take it to the Imperials still left on the water. "When they see the harbor is ours again they will make sail for the mainland." Cyrus: "I'm going into the Palace to kill the Governor." Iszara: "You can't do that alone. "How will you get in?" Cyrus: "I won't be alone. "And the prince shares secrets." Coyle: "Let me come with you, Cyrus." Iszara: "And you aren't going without me." Cyrus: "No,you [sic] help Basil and the league take the harbor. "If we storm the Palace Richton and his men will dig in. It has to end now. "With the League running amok in the water, the Palace will be near empty as they try and stop you. "I'll reach Richton easy and remind him whose seat is the throne of Stros M'kai." Iszara: "They will hear of this in the rest of Hammerfell." Cyrus unsheathes his old sabre. Cyrus: "Then let's make sure it's loud." The scene moves to the Palace. 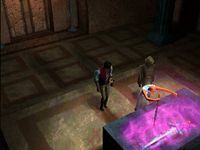 Cyrus walks up to a hidden door and uses the soul sword, which is now glowing, to open it. "Forget about the League, Dram! We must evacuate!" 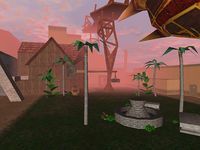 The scene begins atop the Dwemer airship's docking platform. Guard 1: "The assault ship is ready, lieutenant; the men are aboard. They'll never see us coming." Dram: "I'll inform Lord Richton." An explosion is heard in the distance. Guard 1: "What was that?" Viewpoint switches to the large chamber in the Palace. Guard 2: "They're attacking the harbor!" Guard 2: "A mob of them, Governor! 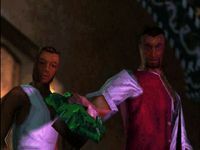 We were caught off our --"
Richton: "The Redguard's behind this! I know he is!" Dram walks into the room. Dram: "He's here. He must have found some new friends." Richton: "Get that Redguard. Take their leader, and they'll fall to pieces." Dram: "The dirigible is ready. Shall we begin the assault on the Restless League's hideout?" Richton: "Forget about the League, Dram! We must evacuate!" Richton: "Who do you think is attacking the harbor, man?! It's the Restless League! They're blowing up our ships! 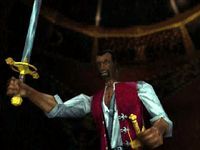 "That Redguard--the one you were supposed to kill a long time ago-- he's succeeded in sparking the rebellion we were sent here to repress." Richton: "Enough! We'll take the dirigible and make for the mainland! Stros M'Kai is expendable! 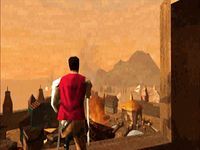 The Redguards may have their day here, but I will return... at the head of a fleet and the Emperor's legions." "I may well be the first Imperial Admiral to surrender at this altitude." "What were those Rules of Engagement again?" "I forgive you anyway. I can do no less." This scene is divided into two parts. Cyrus gains the upper hand in the fight with Richton, knocking his sword to the ground far below. Cyrus: "No surrender, Governor. You just die on your feet." "and that the victor may, within honorable reason, determine his ransom." Cyrus: "Remind me in Hell." Richton: "But where's the money in that? "Or Redguard honor? 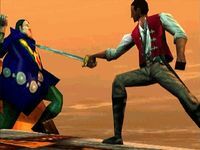 I know a swordsman like you, Redguard, can't kill an unarmed man..."
Richton turns away from Cyrus. Richton: "And as a gentleman, I place myself under your protection. "And as a swordsman of no little accomplishment, I congratulate you on your mastery of the longsword. "And I congratulate you also on your small victory here. "I have failed my Emperor, and may regret surviving to face his displeasure... but..."
Dram sneaks up behind Cyrus and holds a dagger to his throat. Richton turns around and laughs. Several guards surround them. Cyrus: "What were those Rules of Engagement again?" 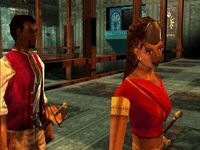 Richton: "I'm sorry, Redguard. The Rules of Engagement govern the affairs of gentlemen. "All you have earned is summary execution." 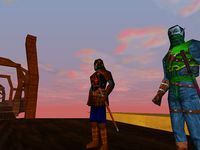 Dram: "You die now, Redguard." Cyrus: "Do it, then, because that'll be the easy part. But look down there, Richton. "Now there's an army that's tasted victory, and one you'll never defeat again." Cyrus: "Richton, it's time you saw that redguard fire you've heard so much about. The soul sword glows brightly and rises in the air on its own, under the power of A'tor's spirit. Richton turns to face the sword and it stabs him through the chest. In the chaos of the moment, Cyrus pushes back Dram. The sword rises high in the air and comes down on Dram, slicing him in half. The guards move in to attack, so Cyrus grabs the soul sword and slides down the side of the airship, tearing it open with the blade. As the airship begins to fall from the sky, a blast of air knocks Cyrus away. He is able to break his fall by holding onto an Imperial flag. On the Palace's roof, he watches the airship plummet to the ground and explode. The soul sword lands behind him. He walks over to the edge, observing the aftermath of the battle between the Restless League and Imperials. Leaguesmen cheer on their ships in the harbor, seeing that Richton has been defeated. Some time passes, and the scene switches to inside the Palace. Guard: "The Old Quarter should be restored in time for the celebrations, milady." Iszara: "Make sure Captain Basil has all the men he needs." Cyrus: "You know I have to leave soon." Iszara: "Can't you at least stay for the celebrations? They are because of you, after all. "Baron Volag came out of hiding to retake Sentinel after he heard of our own uprising. Both he and the Emperor are coming here to work out the treaties." Cyrus: "The Emperor is coming here?" "if all goes well, instead of exploited subjects. A'tor guides me in this." There is a closeup of the soul sword, now in Iszara's possession. Cyrus: "I've never been much for politics." Iszara: "I forgive you anyway. I can do no less." This page was last modified on 15 September 2018, at 23:11.